Introduction: Cancer of the cervix is the second commonest cancer among women worldwide, the commonest female genital-tract malignancy in Nigeria, and one of the leading causes of morbidity and mortality among women in Nigeria. Health workers are the trusted source of medical information and their attitude and practice toward diseases of public health importance like cervical cancer are very critical if the country must make progress toward the prevention of such diseases. This work assesses the knowledge, attitude, and practice of Nigeria's specialist doctors in training toward cervical cancer and its methods of screening because this is critical to its prevention in the country. Materials and Methods: This is a cross-sectional study involving the administration of pretested structured questionnaire to fifty specialist Nigerian doctors in training in various disciplines from different parts of the country. Results: The knowledge of the participants regarding cervical cancer and its screening is very good, with an average of 98%, but their attitude toward cervical cancer screening is poor as only 7 (14%) had ever recommended a woman for cervical cancer screening. The practice of cervical cancer screening among the participants is poor as only 5 (22.7%) of the 22 female doctors in training had ever screened for cervical cancer and only one male specialist doctor in training out of the 28 of them had the partner screened for cervical cancer before this study. Only 4 (9%) of the 28 males had ever recommended cervical cancer screening to their female partner and 44 (88%) of the specialist doctors in training had never spoken to any organization about cervical cancer screening. Conclusion: Though the knowledge of Nigerian specialist doctors in training on cancer of the cervix and its screening is very good, their attitude to it and practice are very poor. Keywords: Attitude; cervical cancer screening; knowledge; Nigerian specialist doctors; practice. Cancer of the cervix is the second commonest cancer among women worldwide, affecting approximately 1.4 million women. It accounts for about 500,000 new cases and 273,000 deaths annually worldwide. Majority of the world's 1.4 million cervical cancer patients are found in the developing countries where it is the most common female malignancy. There is striking disparity in the incidence of and mortality due to cervical cancer in different regions of the world. It is evident that the number of deaths from cervical cancer in low-resource countries is nearly ten times greater than that in high-resource regions. Currently, cancer of the cervix is the commonest female genital-tract malignancy and a leading cause of cancer deaths among women in developing countries, among which Nigeria belongs. According to GLOBOCAN fact sheet of 2012, Nigeria has a 5-year prevalence of 21.6% for cervical cancer, and it is estimated that 10,000 new cases of cervical cancer occur annually, with about 8000 deaths attributed to it yearly. Cancer of the cervix has a prolonged phase of premalignancy and the cervix is unique in being a very accessible organ known to exfoliate readily, thereby offering us good opportunity to access it and hence detect a premalignant or malignant process even in its early stages.,, Early detection and screening programs have reduced the incidence of invasive cervical cancer in developed countries., With the above-known facts, one would expect health-care providers to be knowledgeable about this increasing scourge that ravages women. It is also expected that the medical training of medical doctors, especially those aspiring toward specialization, should imbue in them the right attitude and practice with regard to cervical cancer to protect them, their immediate relations, female patients, and indeed women from being afflicted by this preventable though deadly disease. Furthermore, health workers being a trusted source of information in health matters are obviously looked up to by the public for appropriate health information, attitude, and possibly practice. This public expectation is obviously more if such health worker is a specialist or aspiring to specialize. Though currently there are various methods for the detection of the preinvasive stage of cervical cancer, George Nicholas Papanicolaou's seminal work in 1941 provided a cytological method of detecting this preinvasive cervical lesion and, till date, the Papanicolaou (Pap) smear still remains a cost-effective approach for cervical cancer screening worldwide. Against the backdrop of the foregoing, one would expect medical doctors as apex health-care providers, especially the specialist cadre in training, irrespective of the field of their intended specialization, to be knowledgeable about cervical cancer and its screening and have a positively healthy attitude toward it and be wholesomely involved in its practice. This is more so in view of the importance of cervical cancer screening in preventing cervical cancer in our female population. It is to ascertain the role of Nigerian specialist doctors in training who are a very important segment of Nigerian health elite and opinion molders in the prevention of cancer of the cervix among our female population that this work is being carried out. This is a cross-sectional study that set out to find the knowledge, attitude, and practice of specialist doctors in Nigeria about cervical cancer and its screening. Out of 56 participants, 50 (89.3%) respondents participated and filled the questionnaire. As can be seen from table one, majority, i.e., 39 (78%) were Christians, while 11 (22%) were Muslims. Majority, 48 (96%) were married. The age range of the respondents as can be seen from [Table 1] was from 26 to 48 years, with 26 (52%) of them in the 31–35 age range. As can be seen from table two, all the doctors (28 males and 22 females) had good knowledge of cancer of the cervix as preventable, the commonest female genital-tract malignancy in Nigeria that has a premalignant stage and that it can be screened for by the Pap smear More Details. Forty-nine doctors (98%) knew that it is caused by the human papillomavirus. Also from [Table 2] thirty-nine (78%) participants had cervical screening facility at their centers, while 11 (22%) did not have. It is however pertinent to point out here that some doctors that had facilities in their centers did not know the existence of such facilities as some doctors from the same health facilities contradicted themselves with some saying that they have and others saying that they did not have. 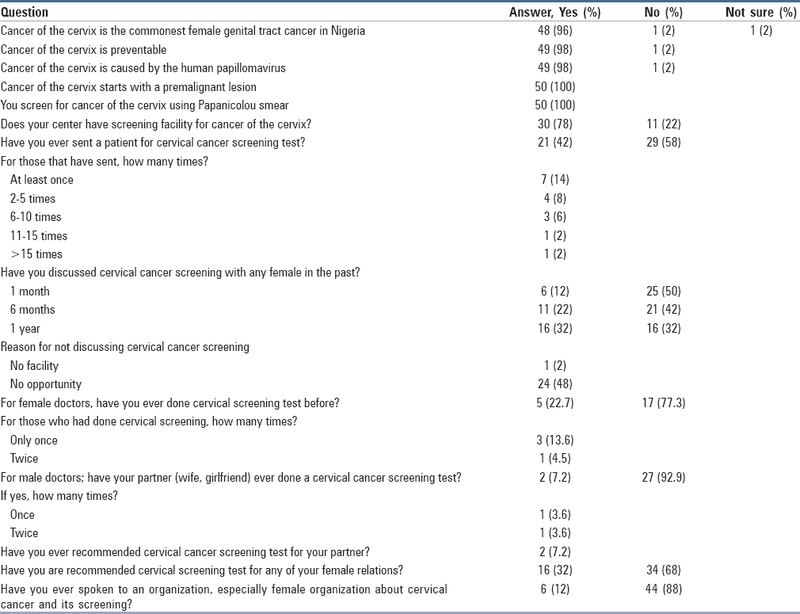 Despite a good knowledge of cancer of the cervix and its prevention by screening, the attitude of Nigerian specialist doctors in training toward cervical cancer and its screening is poor as majority, i.e., 29 (58%) as can be seen from [Table 2] had never sent a female for cervical cancer screening. For those that have, 7 (14%) doctors had sent somebody for cervical cancer screening only once, 4 (8%) 2–5 five times, 3 (6%) 6–10 times, and one each 11–15 times and more than 15 times. Only 6 (12%) Nigerian specialist doctors in training involved in this study had discussed cervical cancer screening with a patient in the 1 month preceding the study and 16 (32%) in the past 1 year. The reason for not discussing cervical cancer screening with females for the majority (24 [48%]) was because there was no opportunity. Many said that it was not their specialty, one said he did not get to see women in his specialty, and two people do not get to remember. The practice of cervical cancer screening among Nigerian specialist doctors in training as can be seen from [Table 2] is poor as only 5 (22.7%) of the 22 females had done cervical cancer screening previously. Three (13.6%) had done it once and 1 (4.5%) twice. For the 28 male doctors, it was in only 1 (3.6%) that his partner had done cervical cancer screening; the partners of 27 (96.4%) had not done it. Only 4 (9%) male doctors in training had recommended cervical cancer screening for their partners. Majority of the Nigerian specialist doctors in training, i.e., 34 (68%) had never recommended cervical cancer screening for any of their female relations and 44 (88%) had never spoken to any organization about it. The Nigerian specialist doctors in training had good knowledge of cancer of the cervix as the commonest female genital-tract cancer in Nigeria (48 [96%]) that is caused by human papillomavirus (49 [98%]) and preventable (49 [98%]) with a premalignancy stage (50 [100%]) and that it can be screened for using Pap test (50 [100%]). This high level of knowledge is not surprising given the high level of medical education of the participants. This finding agrees with works done by Adda et al. and Ayinde and Omigbodu, who found a high knowledge of 93.2% among doctors in their study in Ibadan, as well as Sait who also found a high level of knowledge among doctors in Saudi Arabia. Despite the very good knowledge of Nigerian specialist doctors in training about cervical cancer and its screening, their attitude toward cervical cancer and its screening is not good. Thirty-nine (78%) participants had cervical cancer screening facility in their centers, while 11 (22%) did not. It is however pertinent to point out here that some of the doctors that had screening facilities in their centers were not aware of such facilities as evidenced by some doctors from the same facilities saying that they have the facility, while others said that they did not have. Twenty-nine (58%) doctors had never sent a female for cervical cancer screening, while in the 21 (42%) that had, 7 (14%) had sent a female for screening only once and 3 (6%) 2–5 times, another 3 (6%) for 6–10 times, and one each 11–15 times and more than 15 times. Only 6 (12%) doctors had discussed cervical cancer screening with a patient in the 1 month preceding this work. Majority, i.e., 24 (48%) attributed their reason for not discussing this with females to their not having the opportunity to do so. While others said it is not their specialty and 2 (4%) said they did not remember to discuss it. Majority, i.e., 34 (68%) had never recommended cervical cancer screening to their female relations and 44 (88%) had never spoken to any group, especially female organizations about it. This is rather unfortunate and loss of golden opportunities to enlighten our female populations about the prevention of this deadly disease by the top echelon of the medical profession. A situation where specialist doctors in training did not tell even their spouses and female relatives about cancer of the cervix and how to prevent it leaves much to be desired as these women can suffer from cervical cancer when they have senior medical personnel that could have enlightened them on the disease and its prevention. Health workers, especially these elite groups, are trusted sources of health information to relations, patients, and indeed the public, irrespective of specialty. These senior doctors have relations, and they also belong to organizations such as churches and social clubs where they are trusted in health matters. A positive attitude toward cervical cancer screening by them will go a long way in helping these groups avoid cancer of the cervix. This poor attitude of this elite group of medical practitioners was also got by Sait  who found the attitude of physicians and gynecologists in Western Saudi to cervical cancer screening to be poor. The similarity in this study could be because both studies were carried out among elite medical groups that cut across all the specialties. Some of the doctors in the other disciplines except gynecologists may not see cancer of the cervix as being in their area of specialization, thus their poor attitude to its screening. In fact, 24 (48%) of our study participants did say so. Others may be too busy and preoccupied with managing their patients along the lines of their specialization to start bothering about cervical cancer screening. In our study, unfortunately, 68% of the study participants had never recommended cervical cancer screening even to their female relations. It is like ignorantly sentencing these women to affliction by cervical cancer. The 68% of our participants not recommending cervical cancer screening is much higher than the 19.6% of female health workers that Sundharshihi  got in his work in Chennai that did not recommend cervical cancer screening. This difference could be due to the fact that his work was not done among specialist doctors in training whose specialty may not be dealing with women directly. Moreover, his work was done in a different environment from ours. Despite the very good knowledge of the participants about cervical cancer, its screening, and prevention, their practice of cervical cancer screening is very poor. Of the 22 female doctors in the study, only 5 (22.7%) had done cervical cancer screening before with 3 (13.5%) screening twice for it. For the male doctors, Only 2 (7.2%) had ever recommended their partners to do cervical cancer screening and only 4 (14.3%) had ever recommended it for their partners. This is rather unfortunate. For one, this leaves this important group unprotected from cervical cancer. Again, it would send down the wrong message that cervical cancer screening is not important because if it was, the doctors themselves and their partners would have had it done. This poor correlation between knowledge and practice among health workers was also found by Adda et al. among female health workers in Port Harcourt; Gharoro and Ikeanyi  and Oche et al. in Sokoto (10%) all in Nigeria; Sait in Saudi Arabia; and Kress et al. 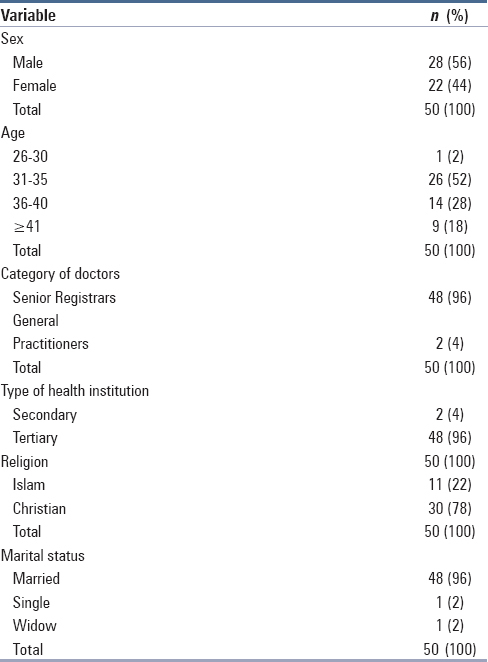 (22%) among physicians in Ethiopia. This similarity in the poor practice of cervical cancer screening among health workers could be due to the erroneous feeling that as health workers, they could have some protection in suffering from cancer of the cervix. This of course is baseless and not true. It could also be due to the fact that health workers are too busy or preoccupied by their work of providing care for their patients that they do not have enough time to think about themselves. Irrespective of the reason, this situation is not acceptable. Health workers must know that they and their partners are all vulnerable to cancer of the cervix like the general population and must take appropriate measures to protect themselves against this disease. Their various professional associations should take up the challenge of creating this awareness among their members and encourage them to screen for cervical cancer and other preventable diseases. The 22.7% of our study participants who had cervical cancer screening, however, was more than the 10% got by Oche et al. among female health workers including female doctors in Sokoto; 7% by Udigwe  among female nurses in Nnewi. This difference could be adduced to the fact that our work was done among specialist doctors in training who appreciate the importance of cervical cancer screening better. The 22.7% of our study participants that had cervical cancer screening is similar to the 22% by Kress et al. among physicians in Ethiopia. This similarity could be due to the fact that both works were done among physicians. Though Nigerian specialist doctors in training from this study had very good knowledge of cervical cancer and its screening, their attitude toward screening is poor. Even of more concern is their practice of it which is also poor. Majority of the doctors believed that cervical cancer screening is not in their specialty and do not speak to anybody including their close female family members about it. If this big killer of women must be prevented in Nigeria, there is a need for all specialties and their doctors in resource-poor countries like Nigeria to see themselves first as general practice doctors that must all join hands to address serious health issues, especially preventable ones like cervical cancer, that decimate their population instead of the present dangerous attitude of seeing themselves as specialists in a particular field who must practice medicine exclusively along the narrow confines of their areas of specialization to the exclusion of other important health areas. Ferlay J, Shin HR, Bray F, Forman D, Mathers C, Parkin DM. Cancer incidence and mortality worldwide: IARC CancerBase No 10. Lyon France: International Agency for Research on Cancer; 2010. World Health Organization. Report of the Consultation on Human Pappillomavirus Vaccines. Available from: http://www.who.int/vaccinesdocuments/DocsPDF05/816screen.pdf. [Last accessed on 2005 Apr 23]. Shafi MI. Premalignant and malignant disease of the cervix. In: Edmonds KD, editor. Dewhurst's Textbook of Obstetrics and Gynaecology. 8th ed. London: John Wiley and Sons, Ltd.; 2012. p. 747-59. Denny L. Cervical cancer prevention: New opportunities for primary and secondary prevention in the 21st century. Int J Gynaecol Obstet 2012;119 Suppl 1:S80-4. World Health Organization, Cervical Cancer. Geneva, Switzerland: World Health Organization; 2015. Available from: http://www.afro.who.int/en/clusters-a-programmes/dpc/non-communicable-disease-managementndm/programme-components/cancer/cervical cancer/2810-cervical-cancer.html. [Last accessed on 2017 Nov 02]. Cervical cancer: Estimated incidence, mortality and prevalence worldwide in 2012. Lyon, Geneva: GLBOCAN Cancer Fact Sheet, International Agency for Research on Cancer, Section of Cancer Information; 2012. Airede L, Onakewhor J, Aziken M, Ande A, Aligbe J. Carcinoma of the uterine cervix in Nigerian women: The need to adopt a national prevention strategy. Sahel Med J 2008;11:1-11. Umeora OU. Cervical cancer. In: Umeora OU, Egbuji CC, Onyebuchi AK, Ezeonu PO editors. Our Teachers – A Comprehensive Textbook of Obstetrics and Gynaecology. 1st ed. Enugu: St Benedict Printing and Publishing; 2017. p. 556-60. Onah HE, Ezugwu FO, Eze JN. Cervical cancer screening: A survey of current practice amongst Nigerian gynaecologists. Trop J Obstet Gynaecol 2001;18:78-81. Bassey EA, Ekpo MD, Abasiattai AM, Ekanem MI. Cervical cancer screening in Uyo, South-South Nigeria. Trop J Obstet Gynaecol 2008;25:13-7. World Health Organization. World Health Statistics 2010. Geneva: WHO; 2010. Available from: http://www.who.int/whosis/whostats/EN-WHS-10-TOCintro.pdf. [Last accessed on 2017 Aug 30]. Chen MK, Hung HF, Duffy S, Yen AM, Chen HH. Cost-effectiveness analysis for Pap smear screening and human papillomavirus DNA testing and vaccination. J Eval Clin Pract 2011;17:1050-8. Adda JD, Ojule JD, Fiebai PO. Knowledge attitude and practice of cervical cancer screening-Papanicolou test (Pap smear) among female health care providers in Port Harcourt. Port Harcourt Med J 2012;6: 74-80. Ayinde OA, Omigbodun AO. Knowledge, attitude and practices related to prevention of cancer of the cervix among female health workers in Ibadan. J Obstet Gynaecol 2003;23:59-62. Sait KH. Knowledge, attitudes, and practices regarding cervical cancer screening among physicians in the Western region of Saudi Arabia. Saudi Med J 2011;32:1155-60. Udigwe GO. Knowledge, attitude and practice of cervical cancer screening (Pap smear) among female nurses in Nnewi, South Eastern Nigeria. Niger J Clin Pract 2006;9:40-3. Sundharshihi SA. A cross-sectional study on knowledge, attitude and practice on cervical cancer and screening among female health care providers of Chennai Corporation, 2013. J Acad Med Sci 2012;2:124-8. Gharoro EP, Ikeanyi EN. An appraisal of the level of awareness and utilization of the Pap smear as a cervical cancer screening test among female health workers in a tertiary health institution. Int J Gynecol Cancer 2006;16:1063-8. Oche MO, Kaoje AU, Gana G, Ango JT. Cancer of the cervix and cervical screening: Current knowledge, attitude and practices of female health workers in Sokoto, Nigeria. Int J Med Med Sci 2013;5:184-90. Kress CM, Sharling L, Owen-Smith AA, Desalegn D, Blumberg HM, Goedken J, et al. Knowledge, attitudes, and practices regarding cervical cancer and screening among Ethiopian health care workers. Int J Womens Health 2015;7:765-72.